This stuff keeps incredibly well, so you can have it pre-boat, mid-beverage and even post-broken-foot if you are as unlucky around water as I seem to be. And it makes a great base if you’re, say, drowning your sorrows in Firefly so you can limp down to the driveway to play beer die. Not that that’s ever happened. Anywho, this recipe uses roasted red peppers rather than raw because I ain’t much for the crunch, so tinker with this as you must. Freedom of choice is American as hell. 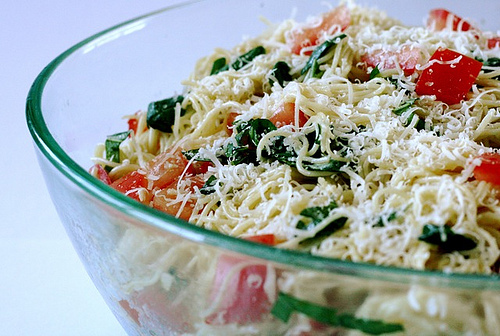 While pasta is still warm, add mayo and all other ingredients. Cover and chill at least one hour (but this is even better after it sits overnight). Season to taste. Eat on it. It’s the yum. *I always undercook the pasta when I know I’m making this a day or two in advance because the pasta will soften as it sits in the fridge. Adjust your level of al dente accordingly.